Research has been conducted both by investigators from the University of Wisconsin as well as local county agents since 1968. Because Antigo silt loam is a soil unique from other UW Research Stations, the plots at the farm provide scientists and growers a research-based representation of this soil type. 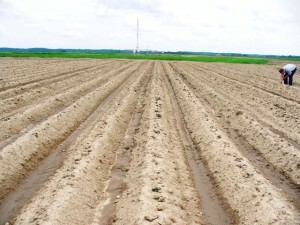 Which is represents a substantial percentage of potato acreage in the state. Many in-kind donations are made to the farm in the form of fertilizer, seed potatoes, custom work, and equipment. The farm is managed on a three-four year rotation in the main experiment field with an additional field managed in continuous potatoes for the purpose of maintaining potato scab inoculum for potato scab research. A crop integrated weather station reports crop canopy conditions for disease forecasting on the UW Vegetable Pathology Website under the Antigo P-Days and Severity Values.